It’s the start of a short work-week, which always makes one a tad off-kilter for getting back on track. And as I start my morning, with my coffee in hand and a quick review of the news, by force of habit (by my mother’s teaching) I always breeze through the obituaries. So what does this have to do with gardening? 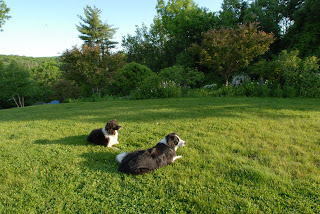 Two border collies not running? Rarity. Enjoy the rest of the week.